How do we know we are eating healthy? In today’s fast paced world we do not seem to have the time to watch our diets and plan our meals,leading to the increase in obesity. The USDA, recently introduced ‘My Plate‘, a nutrition guideline that shows the recommended portions of each food group to be consumed for maintaining good health.This has replaced the much well known ‘Food Pyramid’that has guided people to eat right since the 1970’s. The food pyramid, a triangular shaped representation, gave a general guideline on the quantity and the serving sizes of each food group to be eaten on a day to day basis. The base of the pyramid which was the largest group, was formed by carbohydrates like bread, pasta, wheat, rice etc. Higher up were the fruits and vegetables, followed by the nuts, meat and eggs and dairy products. The apex of the pyramid, which constituted the smallest portion was taken over by fats, oil and sugar. As we go higher up the pyramid, the smaller the portion size of the food. Unfortunately,it was confusing for many to follow, as it mentioned the foods to be consumed in serving sizes which proved to be too vague for many. ‘My Plate‘ is an apt replacement of the Pyramid for today’s time strapped individuals, the design being easy to grasp. It replaces the need to measure out food and teaches us to use visual cues to get an idea of whether we are consuming healthy meals or not. My plate is a graphic representation of a plate which is divided into four quadrants of different proportions. 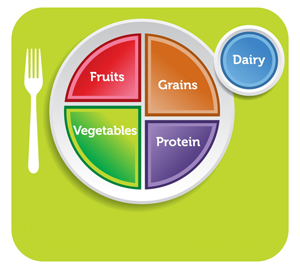 Fruits and vegetables occupy one half of the plate and the remaining half is occupied by grains and proteins. The portion for vegetables and grains are larger than that for fruits and protein. There is a provision of a small circle (which represents a glass), outside the plate, which is meant for dairy products like milk or yogurt. To maintain a healthy weight, it is recommended that we add a variety of fruits and vegetables to our diet. Different fruits and veggies provide different nutrients in varying amounts and eating a variety of them ensures we get adequate nutrients from varying sources. Add color to your plate, eating a rainbow of fruits and vegetables is the key! It is recommended that atleast half your grain intake be whole grains. Refined flour does not contain the essential vitamins, minerals and fibre which are present in whole grains, as the kernel is removed from them during milling. Including whole grains in your diet reduces the risk of colon cancer, diabetes and other lifestyle related disorders. The protein division, consists of vegetarian sources like nuts, legumes, tofu and dried beans. Lean meat provides the necessary protein without the additional fat. Swap whole milk for low fat or skimmed milk. The earlier pyramid had a reference to fat, oils and sweets at it’s apex, which is not present in the new guidelines. It is suggested to have these foods very sparingly. Avoid sodas and sugary drinks, replace them with water(calorie-free!). The above information provided by the USDA for healthy eating are guidelines to improve the eating habits and in turn the health of the public. It is a well known fact that “you are what you eat”. Does your plate look like my plate?